Don't be embarrassed. It is possible at any age. I can speak three languages, build websites and distinguish the difference between various types of bottled water, but up until last weekend — I couldn’t ride a bike. How does that happen? Well, when you’re an introverted, awkward kid like I was, you keep to books and avoid activities involving any sort of need for coordination. Balancing on two wheels and going really fast in the great outdoors? It just wasn’t my cup of tea. But then as I grew up, I got into things like yoga and eventually met a guy who loves riding bikes, so I decided to finally give it a whirl. The first step in learning how to ride a bike as an adult is to get over the embarrassment. Who cares what people think if you fall or if you look silly? The worst thing that you could possibly do is not try, which I did successfully for three decades. I had enough of that. The next step is finding someone with enough patience to teach you. Luckily, after a quick internet search, the Bicycle Coalition of Greater Philadelphia offers affordable monthly classes ($10) from April through October for adult learners. Held in a group setting, I initially expected to be the only person there or at least, be in a group with a lot of old people. Surprisingly, that wasn’t the case. Most of the students were either in their late 20s or early 30s, with the majority of them being women. One twentysomething was determined to learn how to ride before going to Burning Man next year. Another thirtysomething never learned as a kid (like me) and didn’t want to be held back anymore. The instructors informed us that most people are riding a bike comfortably by the end of the two-hour class, (which I found really hard to believe), but hey, crazier things have happened. We started off inside the Lloyd Hall gymnasium (1 Boathouse Row), where the pedals were removed from our bikes. We were then told to “push and coast” around the space to find our sense of balance. After about 20 minutes, I was starting to feel pretty good about pushing and coasting, so it was time to add the pedals. This was a little more difficult, especially considering the need to constantly stop and go, given the limited space in the gymnasium. The instructors decided to have me bike outside on the trail near Lloyd Hall — which was chock full of runners and pro cyclists. If I really want to do this, I just need to keep trying — and so I did. By the time the two-hour class was over and it was time to return our bikes to the rental shop, I was comfortably riding on the flat trail. I would wobble here and there, but I know I’ll get better with practice. Luckily, I exchanged contact information with some of the other adult learners I met in class and we’ve already made plans to go biking again next weekend. 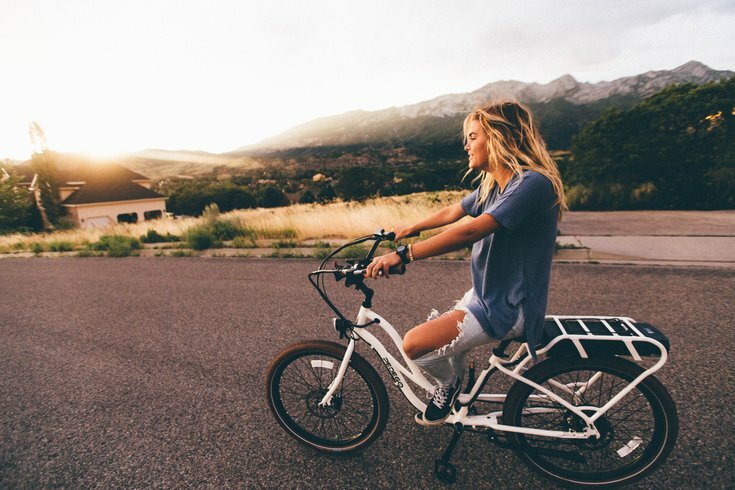 All bruises and sore bumps aside, you’re really never too old to learn how to ride a bike. Now that I’ve got the basics down, a whole new world of adventure lies before me. A wine tour by bicycle in Italy? Mountain biking through Sedona? All of these have been added to the bucket list, but for now, biking to work and Trader Joe’s would be adventure enough.